Adobe Summit is here (and yes, Treasure Data has a booth). It’s arguably the biggest conference focused on digital marketers and Adobe Marketing Cloud customers with 14,000+ expected attendees. Adobe Marketing Cloud consists of 8 products, many of which were acquisitions over the last decade. Probably the most famous of the eight is Adobe Analytics. Formerly called SiteCatalyst, it was the flagship web analytics product by Omniture, which Adobe acquired in 2009 for $1.8B. The answer is one word: enterprise. I will use data to show why this is the case. Now we are ready for slice-and-dicing. 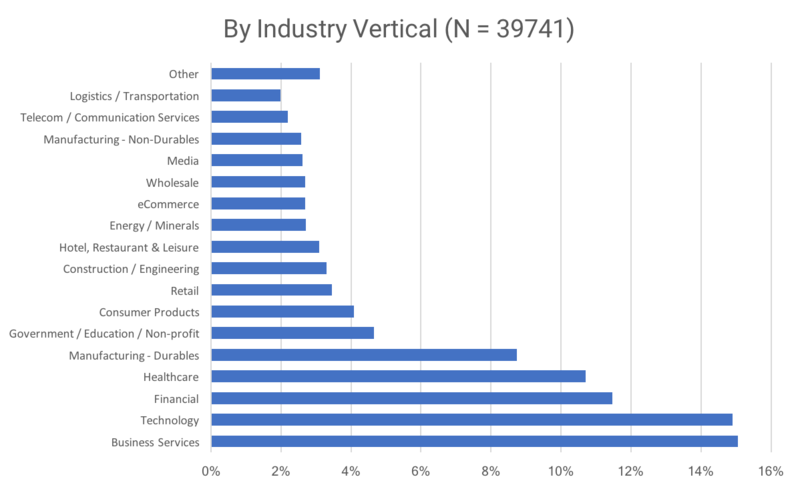 Our sample size is N=39741 and you can see the breakdown by industry and company size at the end of the post. One big difference is the size of the install base. 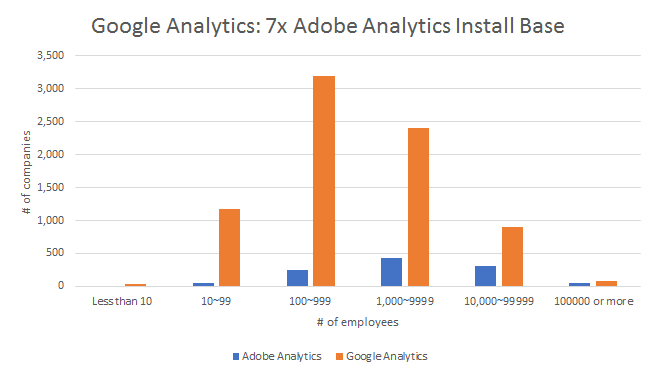 For all company sizes, Google Analytics had a larger install base than Adobe Analytics. The disparity in the install bases is expected. Unlike Google Analytics, which is mostly used as a free product, Adobe Analytics is a 100% paid product. 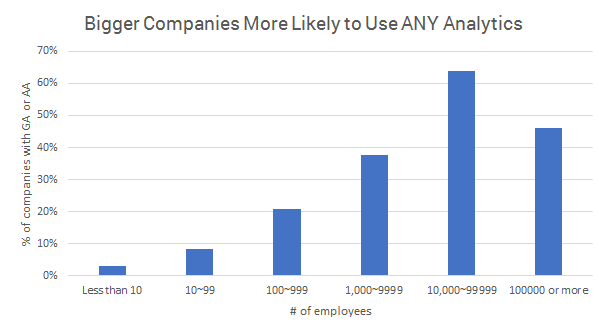 Note how there was zero Adobe Analytics customer with <10 employees in our database. 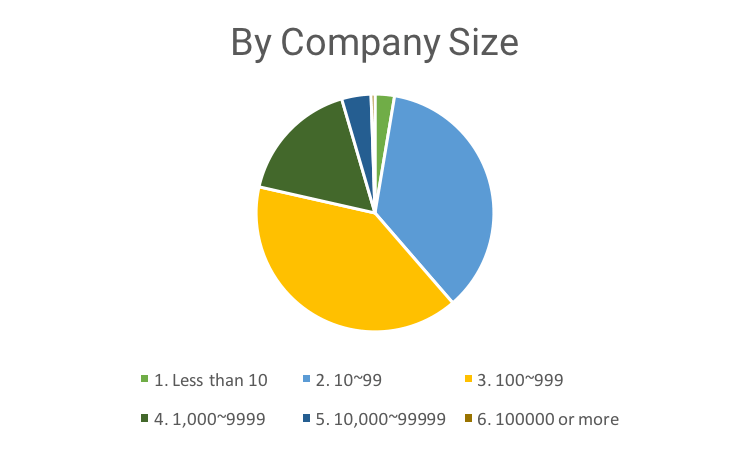 As you can see, even accounting for sample size, it’s fair to say that bigger companies are more likely to use at least some kind of analytics, and the beauty of selling to bigger companies is that they have the budget to pay for critical initiatives like analytics. Sure, Google Analytics is free, but if you have a multi-million dollar analytics budget every year, ROI matters more than price. 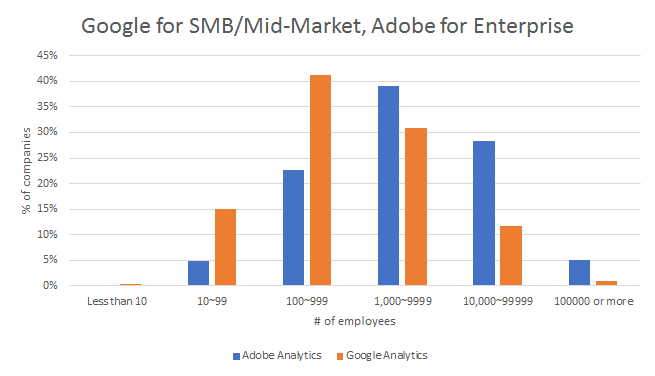 If your analysts are all trained on Adobe Analytics and their insights impact decisions worth millions of dollars (such as deciding on which marketing channel to double down), I predict it will continue to do just fine even when there’s a free alternative like Google Analytics. So, where does that leave us with Google Analytics? A “less advanced” marketing analytics tool? 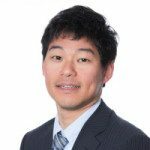 A free alternative without upward enterprise mobility? The answer is neither because Google already monetizes Google Analytics plenty. It’s called AdWords. As you can see, close to 90% of their revenue is based on Search and Advertising. Google Analytics’s native integration with AdWords and DoubleClick, the two main Google Advertising platforms, means that Google Analytics gives more insights about advertising spend than Adobe Analytics within the Google ecosystem, which deepens the user’s engagement within Google’s ecosystem (That said, typical of Google, not all of its products are connected. For example, YouTube has its own analytics but doesn’t integrate directly with Google Analytics). In short, Google Analytics can be a loss leader for Google to funnel more business into their core advertising business.